It’s that time of year again—back to school. Yellow buses, alarm clocks, and of course parent paperwork! Seems like each day my child’s backpack is filled with more and more paperwork. 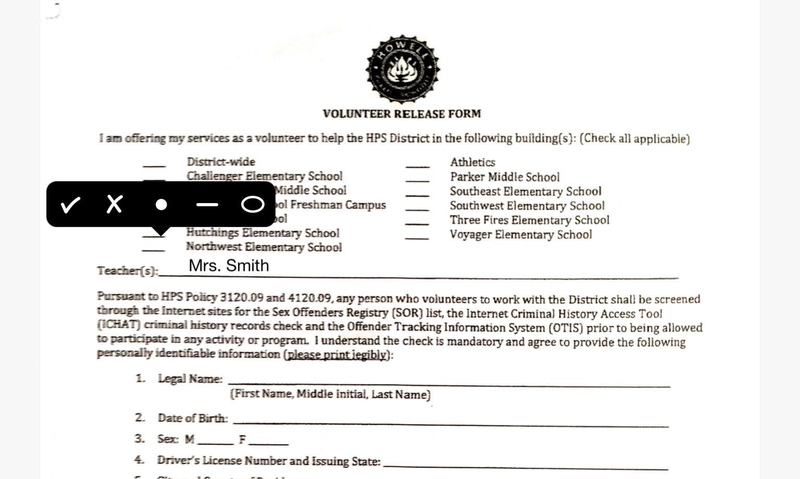 One day it’s Contact and Internet Use forms, and the next Volunteer Release and Field Trip Chaperone forms. Shepherding the distribution, signing, and collecting of these forms must be the bane of each teacher. Who wants to be bogged down with administrative paperwork instead of teaching? Not to mention how many gallons of water, pounds of wood and waste are generated. Born digital. When paperwork starts out digital, sustainability begins, so ask for an electronic copy first that you can fill out on your computer. Take a picture. If you can’t get an electronic copy of the form, take a picture with your iPad or smartphone camera. Stay digital. Try filling out the form electronically. This is easy to do using the free Adobe Fill & Sign app (iOS or Android). No more worrying about scribbling out mistakes or messy handwriting. Just open a PDF of the form or camera image to fill it out. Tap the screen to enter text and press and hold to bring up the check box tools as seen here. E-mail a completed form. When you’ve finished, use the Share icon in the Adobe Fill & Sign app to send your child’s teacher an e-mail with a PDF attachment of the form. This attachment can easily be forwarded to the school administration for filing. Keep a digital archive copy. Are you ever plagued with Déjà vu when filling out a form? It looks familiar but you can’t remember if you filled it out? No worries—just keep a PDF for your records so you know. Imagine the savings to the school district if each parent filled out forms electronically. For example, there are approximately 7,500 students in our district and each student has at least 6 paper forms to fill out and return. 6 paper forms is an extremely conservative estimate and doesn’t include permission slips, transportation forms, medication forms, free and reduced lunch applications, or even the concussion awareness form. So, for just 6 forms, that’s 45,000 forms that are printed, filled out, and returned. 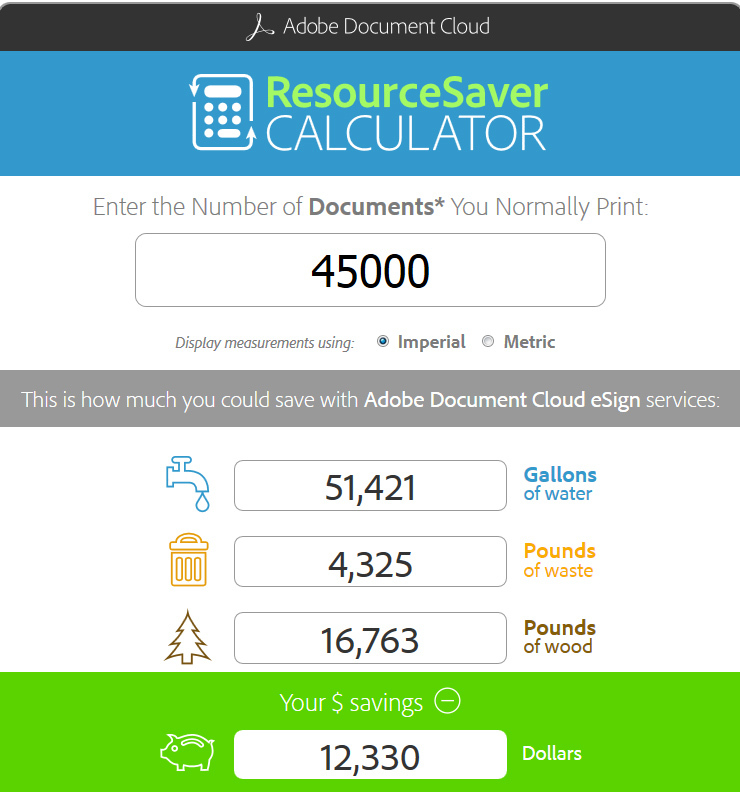 Using the ResourceSaver Calculator*, this could result in over $12,000 dollars in savings, not to mention 51,421 gallons of water, 4,325 pounds of waste, and 16, 763 pounds of wood. So start the school year off right by going digital with your child’s paperwork, and making a commitment to sustainability. Disclosure: I do independent contract work for Adobe Systems, but I was not compensated for this post. I merely saw an opportunity to use the Adobe Fill & Sign app to create a more sustainable school system. *Developed and operated by the Environmental Defense Fund, now under ownership of the Environmental Paper Network.